I had just returned from a wedding assignment which took me almost two hours drive away from where I stay. The wedding took place at Sepang Gold Coast's premium location, the Golden Palm Tree Resort. Me and my photographer partner of the day, Fred arrived as early as 7am in the morning, and we shot a pre-wedding portraiture around the resort and beach locations in the morning. The actual day ceremony actually started in the evening, during sunset, which continued immediately to the reception dinner. All in all, it was surely a unique interesting wedding assignment to remember, and our hosts and also the newly weds have been overly generous and kind, taking care of me and my friend Fred very well. Coming home from a full day shoot, I just felt like taking the whole Sunday slow and easy. There was that constant nagging behind my head that reminded me to make time for some shutter therapy session, but my body just refused to move. Not wanting to just waste the whole day away, I finally decided to make a quick stroll (which then lasted less than an hour) and grab some shots. I was not exactly in the mood to go all out and attack the streets like tomorrow will never come, and I chose to shoot everything from a distance instead. Not my usual style, but it was necessary as I was not in the best of myself to approach strangers and make things work. I am still on my "slow-update" status at the moment. Have not been out shooting much lately. It is after all still the holiday season, plus I am having a rather interesting wedding assignment this weekend, which I look forward to very much. Thinking through all things around me at the moment, I felt like I am in the middle of the road. Surely I have walked far enough from the edge, but I have not quite reached the other side yet, and that seemed to be quite a bit of distance away. What is stopping me from crossing all the way? 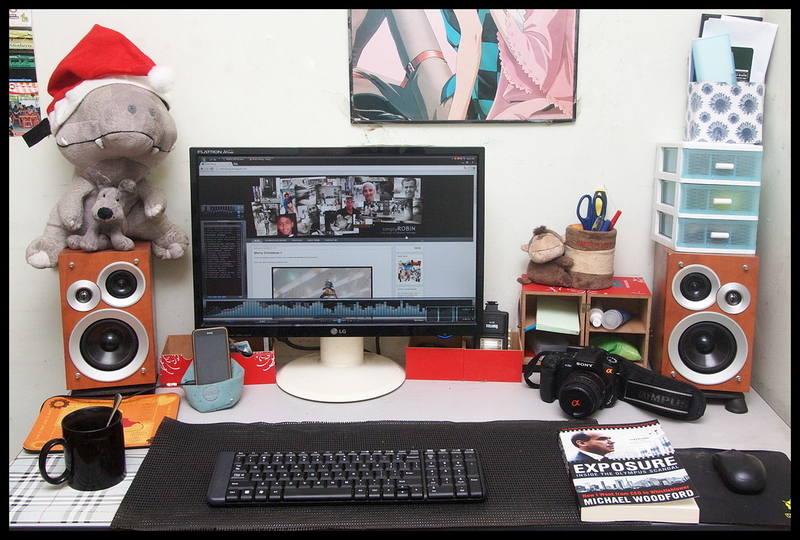 It was my 28th birthday yesterday, and as a thank you to all you beautiful people for your undying loyalty and support to this simplyROBIN blog/website, I give you a glimpse into my mini-workstation, or more like a snapshot of whatever that can be seen on my desktop. Yeap, this is where all the photo post-processing has happened, and countless hours has been spent on writing blogs, replying comments and emails. As well as monitoring what some weirdos and trolls wrote about me on 43rumors and DPReview forum sites. To all you beautiful people out there, have a Blessed and Merry Christmas !! Have you seen a spinning Christmas tree? About few weeks ago, I was shooting alongside a friend and photographer Jason Lioh for a wedding assignment. It was a very beautiful wedding indeed, and emotional one too. It was not a usual thing to get weddings happening in the outdoor setting, and thankfully the weather was overcast, with no harsh sun. I was working with Olympus DSLR E-5 and Zuiko digital lenses, the 11-22mm F2.8-3.5 and 50mm F2 macro as my main gear setup, with the use of FL-50R flash (ceiling bounce) when necessary. I also brought along the Sony A350 and the 50mm F1.8 as the secondary system. I ended up using both the Olympus with 11-22mm, and the Sony with 50mm F1.8, and this combination actually covered most of my shooting needs for the assignment. Below is a slideshow compilation of photographs taken on the actual day, presented during the reception dinner. Photographs were from both myself and Jason. Slideshow credit goes to Jason, he did the compilation. Watch in full HD for maximum image quality. Nevertheless, since nothing interesting actually happened, lets just put that behind us, and make something happen for ourselves. For me? I choose to go on with my shutter therapy. I was meeting up with a fellow Sarawakian friend and amazing blogger, Cyril Dason and Dinah for lunch at Pavilion, KL earlier today. Therefore I planned my shutter therapy to coincide with the lunch meet. I arrived about an hour earlier, and an hour was more than I needed when I was shooting solo on the streets. I was privileged to be the wedding photographer for a great friend, Alvin. It was a joyous occasion ! I was using both Olympus and Sony together for this shoot, Olympus E-5 with 11-22mm F2.8-3.5 for my wide angle needs, and Sony A350 with 50mm F1.8 for close up shots. I did use flash for indoor shooting, the FL-50R on Olympus and a third party with TTL compatibility for the Sony. Both cameras worked well together, and they delivered the results that I required. Surely this combination saved me a lot of trouble of changing lenses. Maybe it is time for me to get one? RM6 is sure cheap, for a big city like KL. On a second thought why not let it grow? Sony A350 and 35mm F1.8 lens. I liked how the customer was in such a vulnerable state in this photo, and the barber had that razor sharp knife.... as if saying "your neck is mine". Ok ok Christmas is coming. Think happy thoughts, think happy thoughts Robin !! I was looking through my set of color photographs taken at Petaling Street yesterday, as I have published them here in full glorious color. One particular shot stood out, which I thought would have been much better with monotone processing. Alright I admit I was giving myself an excuse to try the new Snapseed software that I have just installed few days ago, the hype of using it to process my black and white images different is still going strong. The above image was processed with Snapseed. The original color image is shown as below. Enough Black and White. Let There be Color! I think I must have been obsessed with black and white images lately, that I did not realized I have somehow neglected the wonderful colors the old Sony A350 CCD sensor is capable of rendering. Early this morning, with the soft, warm glow of morning light, I went to Petaling Street, together with Kelvin and Nick, we attached the streets. Though the Sony A350 was an old camera, at the base ISO100, the image output is simply amazing, rich in detail and pleasing in overall color reproduction. Coupled with the Sony 35mm F1.8 lens, it was as versatile as it can be, being able to have a little bit of wide angle shooting when I move myself backwards a few steps, and at the same time, not losing my need and desire for close up portrait shooting, as I stepped in closer to my subject. The 35mm lens works very well with A350, I am comfortable and work efficiently with the 50mm equivalent focal length (in 35mm format conversion) and that F1.8 wide aperture was more than sufficient to render delicious shallow depth of field. So here is the answer to the questioned I posted a few days back, I got myself Snapseed, and have been trying this new software (new to me) and I am really liking the processing handling of black and white files. It does the monochrome images very differently, with added quick shortcut processing that adds interesting effects (something mobile phone users have come to love), called filters. I have come to personally love the "Drama" effects, as well as the default black and white processing, which includes flexibility of using color filters (I use yellow and orange filters from time to time to create the skin tone "pop"). The reason I am so drawn to the "Drama" effects was the quick ability to produce a little bit of "HDR" look, without having completely destroyed the image with the overcooked impression, with the option to control how much "strength" applied for the processing. One can judge how much processing and apply individually on image to image basis, and I really love how the details and separate tones just jumped out with this quick "drama" filter. It strongly reminded me of Olympus' default art filter, the "Dramatic Tone", which I loved very much, but my only complain with it was lack of control to tone down the super-processed, over saturated, black-ish look. This issue was solved with Snapseed. This morning, Kelvin brought along his new gear, Fujifilm X-E1, together with the amazing 35mm F1.4 lens for our street shooting. 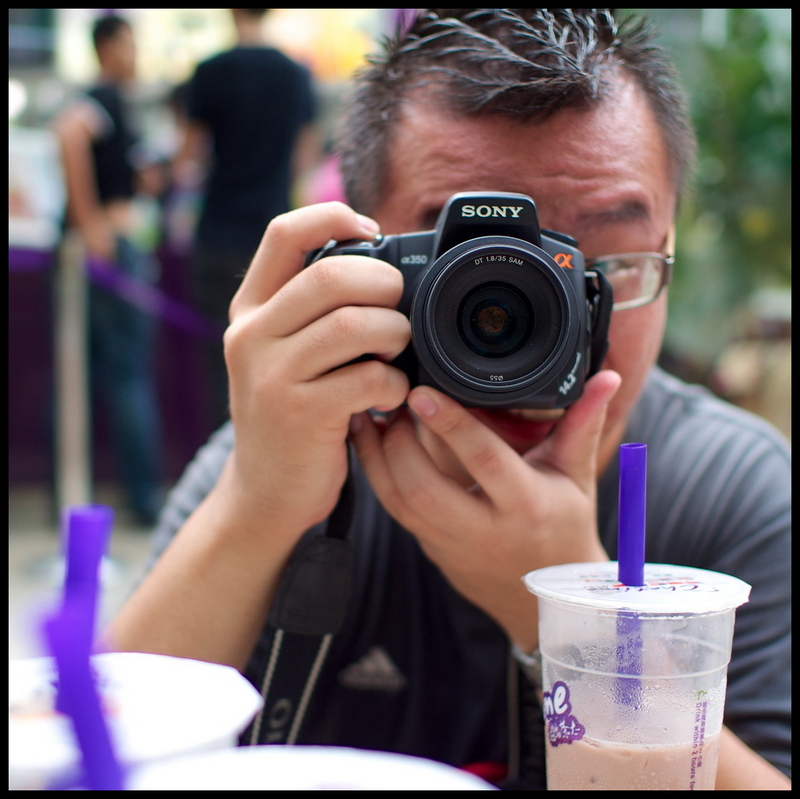 I had my Sony A350 with the 35mm F1.8, and we attacked the Pudu Market. I think I should start calling my market hunts as "Market Shooting" instead of street shooting, it would sound more appropriate, would you agree? Kelvin was giving his new, amazing X-E1 its first trial run, as I was anticipating what would come out from the oven baking of Snapseed from the files I got this morning !! Giving a new post-processing software a run can be just as fun as acquiring new gear. Ok, Ok, maybe not exactly the same, but the poor self of me who cannot afford buying new gear all the time would like to believe it is the same !! Do cut me some slack hey !! All images were taken with Sony Alpha A350 and Sony DT 35mm F1.8 lens. It is nearing the end of the year, about time for "the best of" series of my photographs, and writing a blog to sum up the year 2012 that has been. However, as I was looking through my collection of photographs taken at Kuala Lumpur streets, I started to have a different idea, to do something rather differently. I compiled 80 of my personal favourite photographs and created a photo-slideshow, titled "Beautiful Strangers". And.. here it is. Enjoy !! For optimum impact, do watch in full HD !! Special thanks to Silent Scenery for the music. Please do take some time to check out their awesome music, you may find them and "like" their official Facebook Page, buy their music from CDbaby or iTunes. Kodak CX7430, taken in 2005 at Swan River, Perth. The above image kind of reminded me of the classic children's tale "the ugly duckling". Then again, from the photograph I took, the reality was a lot less cruel than the original tale. On another thought, that white bird could just be a seagull goofing along. Whatever it was, I thought this was quite an interesting photograph. Whatever it was, that moment was very special to me. I was on my way home from the city, taking the TransPerth bus number 102 close to sunset. 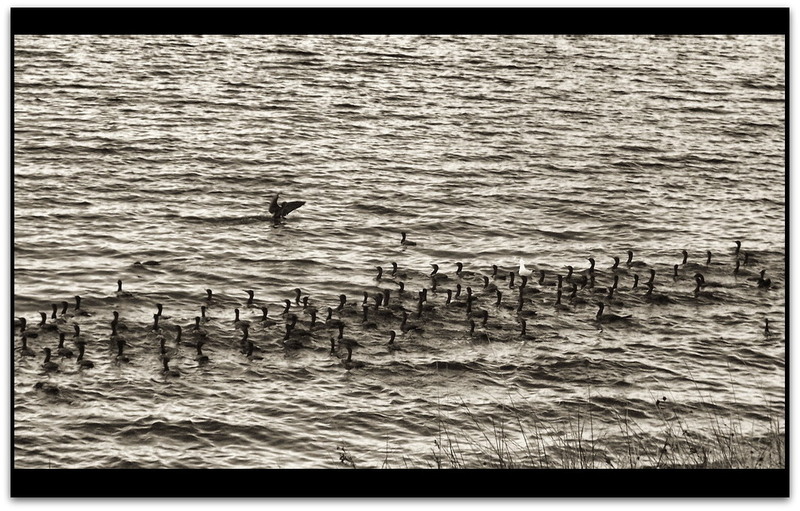 The bus took the riverside drive, and as I was looking out the window over the majestic Swan River, I saw huge flock (do you call them by flocks?) of ducks in the river. Though I was still about 5 minutes bus ride away (and about 20 minutes walk to where I lived) I immediately stopped the bus and got down. I had an old, now dead Kodak Easyshare CX7430, a 4MP dinosaur and I started making shots happen. Any modern photographers will tell you that post-processing is very important, and is an integral part of the whole digital photography workflow. Only through experimentation and exploring different options can we discover new things, and learn to pick up what works for our own style and preferences. I wish Kuala Lumpur has more open parks with lusher greenery, so that our option for photography would not be stuck with everything steel and concrete. 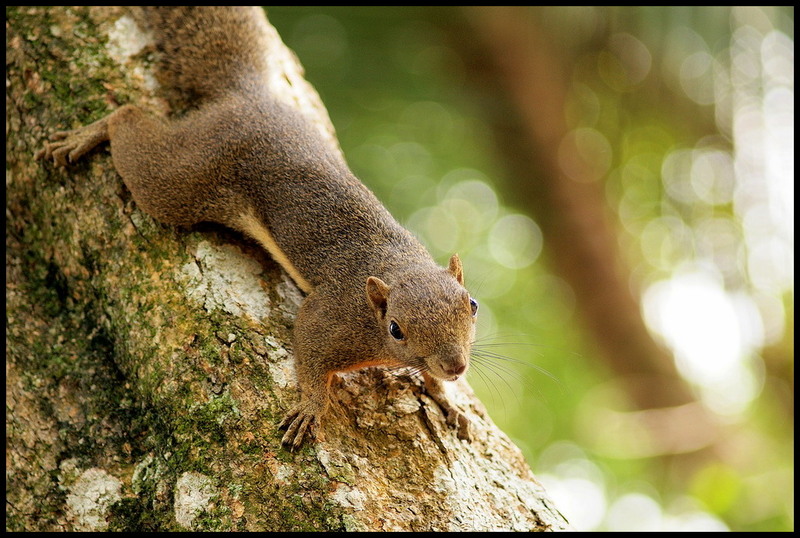 In my process of digging older photographs (which at the same time I discovered the previous entry's fashion show photos), I came across some rare squirrel shots which I did. I think I must have just acquired my Olympus E-5, and I was using the much loved 40-150mm F3.5-4.5 telephoto zoom lens. Before we dive in with beautiful photographs of models doing fashion show, allow me to make a public service announcement. Venue : Unit No.10-8, Menara 1MK, Kompleks '1 Mont' Kiara', No. 1, Jalan Kiara, Mont' Kiara, 50480 Kuala Lumpur. Kindly log on to http://home.olympusimage.com.my/workshop.html for registration and RSVP by 12th Dec 2012 (Wednesday) if you are interested to join. Sanjit is a great friend, and an amazing photographer whom I admire. 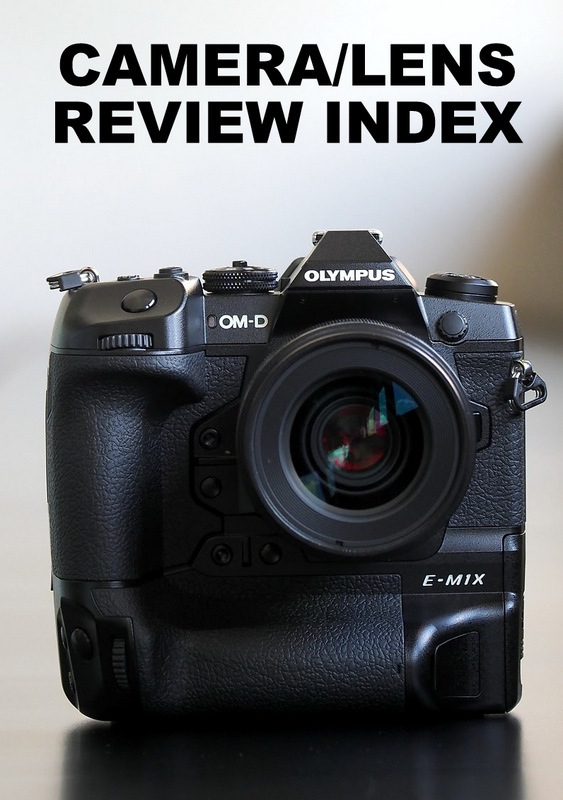 We have worked together on several occasions, and one notable project was the Olympus OM-D E-M5 review (he did the video part). He has recently won an international award in IPA. Basic photography controls of the camera, and technical execution/understanding are very important. Do give this workshop a consideration if you intend to maximize the use of your gear. Depending on my work schedule, I might make it to the workshop ! There was a time not too long ago, when the only camera I had with me was the faithful Olympus DSLR E-520, I always kept an eye out for any free public fashion shows happening in major shopping malls, and religiously would shoot them as if I was the paid photographer for the events. I think it is difficult to explain the thrill and fun of shooting fashion shows, of beautiful models doing their thing walking down the runway. I also understand that most free shows were not exactly up to the standard of glitz and glamour as prominently highlighted in the fashion world (I know not much of that alien planet) but being a young photographer, and being a boy who appreciates female beauty, I find fashion shows very, very attractive, and an immense joy to shoot. I came across an old archive of unprocessed photographs of a fashion show held in July 2010 at Pavilion KL. The Olympus E-5 was not even out then. It was also the time when I just started exploring street photography (and produced almost all crappy images at that time). I think I must have just acquired the 50mm F2 lens, and I remembered myself wishing that I have brought along the 40-150mm F3.5-4.5 telephoto zoom lens instead. Nonetheless, looking through this set of photographs, it brought back a lot of memories, and surely I do miss taking fashion show photographs. Perhaps I should start hunting again. I had the privilege to attend an official user gathering for Sony Alpha and NEX users at Studio Zaloon, Pudu Plaza earlier this afternoon. The event was jontly organized by Sony Malaysia and Studio Zaloon, with the purpose to enable to Sony users to get together and share their experience, photography knowledge and photographs. The gathering happened in late afternoon, and Pudu Plaza was situated at Pudu, a place which has become very frequent for my street hunting sessions. Therefore, it was only natural for me to plan my schedule to fit in some street shooting just before the event. I roamed the streets of Pudu, and then into the open air wet market with the Sony Alpha A350, and the 50mm F1.8 lens. As much as I loved and preferred the 35mm F1.8, somehow, there are times I really want to work with something longer. Today is the day where I felt I wanted to distance myself from my subjects, step myself backward a little, and compose my shots a little differently. Also, this was one of the rarest occasion where I actually started my shooting session close to noon, hence the lighting was a lot harsher than usual, and surely this put the A350 to test when it comes to handling difficult dynamic range situations. After all, the Sony Alpha DSLR in those days, in comparison to the competitors from other manufacturers, boasted to have better dynamic range handling. Sony Alpha A350 with 35mm F1.8 or 50mm F1.8, in extremely dim lighting condition. Is it just me, or is the PC Fair downsizing? It felt a lot smaller this time around. I have always had strong fascination for the tiny world of insects and spiders, partially thanks to strong inspiration and much kind guidance from fellow Olympus shooter Amir Ridhwan. There was a time I dedicated most of my shooting time in the weekend looking for macro subjects, and worked very hard to improve my lighting setup and shooting techniques. I only had my trusty Olympus E-520 and the budget, yet very useful and sharp Olympus Zuiko Digital 35mm F3.5 macro lens, which I wished I did not sell off. It was probably one of the lenses which I regretted selling, and wished to buy back when I intend to get back to the insect macro game. Then suddenly the Sony happened unexpectedly, so now the 35mm macro will have to wait. Digging through my old archives, as far back as 2009 (not that far back actually, but I have first picked up a DSLR in 2008, so I was fairly new back then when I took the shots in this blog entry) I found many photographs which brought back memories. There were times I braved the rain in the butterfly park, shooting butterflies with water droplets on their eyes and wings. There were times I ventured into the reserved forest in the middle of the night (we went in at 9.30pm and got out from the jungle some time between 1.00am-2.00am) for night insect macro hunt. Those were the times of real adventures I dare say, somehow the process of hunting for subjects was a huge part of the excitement. When I found something I have not encountered before, the adrenaline rush was like nothing I have felt before, and as I worked the camera and flash to capture the shots, it felt "victorious". Ok, that was not exactly the best word to describe my feeling, but it was a great feeling, and it stayed on even until now, when I viewed back the old photographs. They say that emotional connection you have when you made the photos is temporary, and you should not rely on that to judge your own photographs. Rubbish. That emotional feeling, sometimes, is what makes the whole shooting process worthwhile. Never, never disregard that. When you open your eyes, like really, really open your eyes, the world around you will surprise you. The beauty in nature can be hidden, and it was an indescribable joy to discover the world of macro insect and spiders. All images in this entry were taken with Olympus DSLR E-520 and Zuiko Digital 35mm F3.5 macro, with external flash FL-36R. 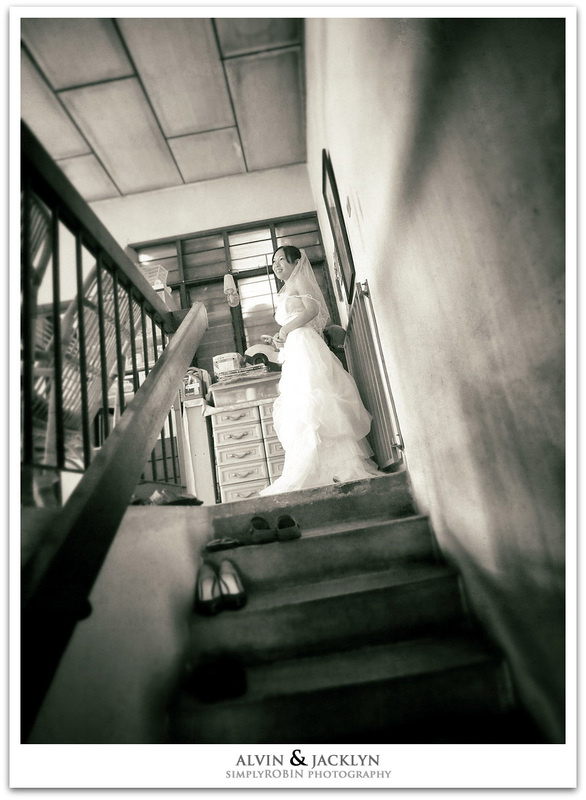 Images were shot in various locations around Kuala Lumpur, in the year 2009. The more I use the Sony 35mm F1.8 lens, the more I feel right at home with it. The perspective it produces was just nice (about 52mm focal length on 35mm equivalent format), not being too tight, having room for plenty of background, allowing the subject to have space to "breathe". Yet at the same time, it is not too wide, it allows for some very good close up shots if needed, and I get sufficient working distance between where I stand and where the subject is, and not being overly close until they feel uncomfortable. Usually I'd say standing about 2 meters away would be ideal, and being 1.5 meters away is still alright, but working at 1 meter and nearer, people would have that "WTF" look on their facial expression, something I try to avoid. What is the point of shooting portraits of people when they look as if they don't like to have their photos taken in the first place? Sony A350 and that 35mm F1.8 on my hands. Image courtesy of Shaun the Footless Fish, taken with the Voightlander 17.5mm F0.95 lens on his OM-D.
Malaysian supermodel, Amber Chia on stage fashion show. Olympus DSLR E-520 and Zuiko Digital 40-150mm F3.5-4.5, with use of external flash FL-36R. Important Note: I have been away for the past weekend to Batu Pahat on a wedding assignment, with very limited connectivity to Internet. Therefore I shall be replying comments and emails a little slower than usual. The weekend has been quite a fulfilling and enjoyable one !! It was a Saturday morning, that Shaun, a friend from Brisbane whom I have shot on the street previously, called for a street shooting session. It was decided among-st the group that the shooting location would be Petaling Street, and everyone (at least those who confirmed) agreed to meet on location. However, as Shaun and I arrived, it was only the two of us, and somehow, somewhere communication went wrong and the few others who originally were supposed to join Shaun (I personally made the confirmation), ended up on the other part of Kuala Lumpur streets. Oh well, so much for modern technologies keeping everyone connected. We decided to shoot on our own, at Petaling Street.